"Go get the treasure. Doesn't it look pretty?" 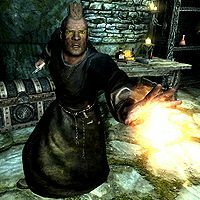 Sild the Warlock is a Nord elemental mage who can be found in his lair in Rannveig's Fast, a Nordic ruin located in the western mountain range just south of Morthal. He uses the ruin for his own sadistic experiments and has summoned numerous subjugated ghosts to protect his secret. He is clad in randomly determined enchanted robes, with a pair of boots. He carries the dungeon key and a leveled dagger (up to glass quality at level 18, and with possible enchantments), as well as some random loot. He also knows a leveled set of spells. See the Fire Mage article for more information. As described in his journal, he has set a trap in the dungeon, baiting a trap door with a large, glowing, empty chest. Coincidentally, this is located directly in front of a word wall for the Kyne's Peace shout. In the depths of the ruin, Sild will wait for curious adventurers to take the bait and fall into his trap, thus rendering them helpless subjects for his personal amusement. You can approach Sild in two different ways; either fall into the trap, or walk all the way down to his torture chamber for a surprise attack. If you aim for the surprise attack, you will have to sneak up on Sild, as he will be waiting for the next unlucky adventurer to fall into the cage, impatiently mumbling: "Come on! You know you want what's in that chest. Just walk toward it! ", "Just walk toward the chest! Gravity will do the rest. ", or "I know you're up there. Go get the treasure. Doesn't it look pretty?" If you wait long enough, an Orc bandit will take the bait and fall down in the chamber, dying immediately. A frustrated Sild will comment: "Well...that's disappointing. This one didn't survive the fall either. No matter. Another one will be along any time now." He will then keep wandering around the cage, hoping for more victims, but nothing else will happen. 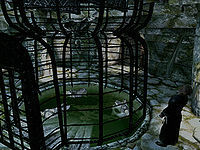 If you fall into the trap, you will drop down two sets of trap doors into a flooded cage with several dead bandits and Sild standing directly outside. When he sees you he will sadistically utter: "Ooooh...yes...yes. You've fallen for my trap! Greed makes a great lure. Odd you didn't die from the fall though. Most do." He will then look at a dead body at his feet saying: "Oh, and don't mind my assistant here. He may have seen better days, but he's still more help to me dead than he was alive." He will start to search the table in the chamber, saying: "Alright, let's see if we have something here to end this as quickly as possible. Don't worry though. It'll be relatively painless...relatively. It's got to be somewhere around here! Now where did I put it?" He then proceeds to a set of shelves: "Hhhmmm...maybe I put it over here." When he reaches the second set of shelves, he will turn towards you and say: "Ah...Here it is. Now, if you'd be so kind as to stand still this will be much easier for me to do. Oh, and I wasn't entirely truthful before. This is actually going to hurt a lot. You see, you have to be dead in order for the spell to take hold." He will then cast his Oakflesh spell on himself and shower you with flames and firebolts. Rannveig's Fast: Claim the force of power from Rannveig's Fast. Sild was supposed to carry the unique Sild's Staff, but it never made it into the game. Sild wrongfully pronounces his deceased assistant as being male. This page was last modified on 30 August 2018, at 22:04.